The routine administration of vaccines in dogs has been one of the most significant factors in the consistent reduction of serious canine infectious diseases. This approach has resulted in excellent disease control for infections that were once considered important causes of morbidity and mortality. Although all veterinarians agree vaccines are necessary, the frequency in which they’re given is debated. Veterinarians need to administer the rabies vaccine as defined by law, but other core vaccines for canine distemper virus (CDV), parvovirus (CPV-2) and canine adenovirus-2 (CAV), are administered more often than necessary. Vaccines are largely safe, and are intended to improve the health and welfare of animals, but when problems do occur and the animal didn’t even need the vaccine, that’s unacceptable. More puppies and kittens need to be vaccinated with the core vaccines because there are many that never get vaccinated. It is known that dogs often maintain protective antibody to CDV, CPV-2, and CAV-1, (from vaccination with CAV-2) for three or more years and numerous experimental studies support this observation. Core vaccines should not be given any more frequently than every three years after the 12 month booster injection following the puppy/kitten series, because the duration of immunity (DOI) is many years and may be up to the lifetime of the pet. In order to ensure the existence of duration of immunity, titer testing may be used. For canine core vaccines there is excellent correlation between the presence of antibody and protective immunity and there is long DOI for these products. Antibody tests can be used to demonstrate the DOI after vaccination with core vaccines. Therefore, when antibody is present there should not be a need to revaccinate the dog for the specific disease being tested. If antibody titer is absent (irrespective of the serological test used) the dog should be revaccinated unless there is a medical basis for not so doing. Currently a significant drawback in performing antibody tests is the cost and the time to obtain results. More often than not, titer testing requires sending blood or serum to a lab which entails a relatively expensive test, with an answer from the lab obtained some days later. For many years a “user friendly” rapid and cost-effective test has been required. Recently the Canine VacciCehck was approved by the USDA. The Canine VacciCheck is intended to be used as a diagnostic tool to evaluate the antibody response to the core vaccination or infection by Infectious Canine Hepatitis (Canine Adenovirus), Canine Parvovirus and Canine Distemper Virus. The test is a rapid, simple, reliable and cost-effective “in house” assay and is especially useful to determine if a dog requires additional vaccination. This may save the dog unnecessary vaccination. It can also help determine the vaccination status of a dog with unknown vaccination history to help determine if puppies have received immunity from vaccination, if a sample is collected 2 or more weeks after the last puppy dose at 14 to 16 weeks of age. If the puppy does not have a CDV or CPV-2 titer, it should be revaccinated immediately and does not wait until 1 year of age. What is also unique about the Canine VacciCheck is that the tests can be individualized. In addition, test results are preserved, with a simultaneous result developed for all three core vaccines per test. This should prove useful for the veterinary clinic, shelter or the veterinary lab alike. Results are available within 20 minutes. The kit is a “self contained” dot ELISA titer test kit, not needing any reagent preparation. Practitioners therefore have a quick and simple in-house test that can be performed at a reasonable cost to the pet owner. In the past, even though there was an intention by many pet owners and/or veterinarians to carry out titer testing for core vaccines instead of automatically revaccinating, the price of a titer test when compared to a vaccination was often significantly more expensive. 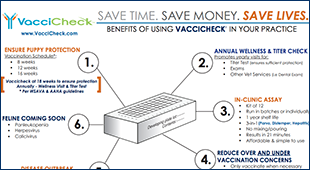 Therefore, with the price factor lessened, via the use of VacciCheck, the concept should be that instead of sending reminder cards for vaccines, veterinarians should be sending ‘annual health check’ reminders. The ‘annual health check’ removes the emphasis from, and client expectations of, annual revaccination. The annual health check may still encompass administration of selected non-core vaccines which should be administered annually, as the DOI for these products is generally one year or less. Neither a titer nor annual vaccination is necessary every year because of the core vaccines’ duration of immunity. However, a blood sample taken yearly from an animal for a titer check is preferential to an unnecessary vaccination as a vaccine may cause harm. Medically, however, I don’t know of any harm that might come from taking a blood sample and doing a titer check. Also, there are many practitioners and owners who need assurance that an animal does have immunity. An antibody test such as the VacciCheck can give them that assurance. Antibody assays for CDV, CPV-2 and CAV-1 are the tests of greatest benefit in monitoring immunity, especially after the puppy vaccination series. On completion of the puppy series at 14-16 weeks of age, an animal should have a positive test result, provided the serum sample is collected 2 or more weeks after vaccination. Seronegative animal should be revaccinated and retested 2 or more weeks later. If it again tests negative, the dog should be considered a non-responder that is possibly incapable of developing protective immunity. In order to confirm the puppy protocol, the Canine VacciCheck can be deemed a cost effective, user friendly and expedient titer test for Hepatitis (Canine Adenovirus), Parvovirus and Distemper.